Samuel Tadesse found consolation at the Tsadkane monastery, but he saw that more needed to be done. The following is the first in a three-part series of I-TECH success stories from Ethiopia. Samuel Tadesse discovered he was infected with HIV in 2004, after undergoing a routine test as part of a U.S. visa application. He spent the next four years feeling utterly hopeless. 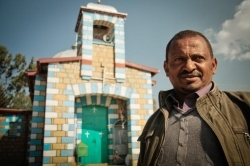 Although not a church-going man, Samuel visited one of the country’s largest holy water springs as a last resort: The Tsadkane monastery, located within the Amhara region of Western Ethiopia. The holy water site is visited daily by up to 5,000 pilgrims, all in search of a cure to their ailments by way of prayer, holy water consumption, and bathing. The majority of these pilgrims are extremely ill, and a large group have been diagnosed with advanced HIV/AIDS. Samuel immediately experienced consolation and decided to live at the site of the well. However, he soon realized that many of the people living by the well, waiting for a miracle, were dying. He also understood that the strict diet of holy water and a single daily portion of dried barleycorn flour was inadequate nutrition for those who were sick. He resolved to try to improve the welfare of the stricken community. Samuel’s fundraising efforts, launched at local bus stations, quickly gained momentum, and soon he was able to buy and distribute bread and blankets to the dying pilgrims at Tsadkane. In just a few months, the number of people benefiting from the new funds had grown from 115 to 1,200. But Samuel knew that blankets, bread, and water were only a short-term solution. So he approached the local Church. Historically, the relationship between medical science and the Ethiopian Orthodox Christian community — the country’s largest religious group — has been contentious. When the AIDS epidemic began to spread rapidly in Ethiopia, any discussion in favor of antiretroviral treatment (ART) was discouraged. According to the Church, there was only one treatment for HIV patients: faith, prayer, and holy water. The Church donated a small thatched hut to shelter HIV victims, but despite Samuel’s commitment, he didn’t have the capacity to accommodate the ever-growing numbers. The facilities at Tsadkane provide HIV testing, counseling, treatment, and care. It wasn’t long before the International Training and Education Center for Health (I-TECH) learned about the growing HIV community living at the Tsadkane holy water site and the urgent need to scale up Samuel’s operation. In response, I-TECH formed a partnership with the Ministry of Health in 2008, based on a commitment to promoting access and adherence to ART as well as providing care and support services for HIV-positive people seeking a holy water cure. Between 2009 and 2013, with funds made available through the U.S. President’s Emergency Plan for AIDS Relief (PEPFAR), I-TECH provided more than US$200,000 in support to the shelter. During this period, 1,370 HIV patients were successfully rehabilitated after being brought to the shelter in a critical health state. With I-TECH support, Samuel was now able to offer and deliver extensive counseling on HIV testing and ART services to the community of people that had gathered in search of his help. “It was a huge relief” to have I-TECH’s support, says Samuel. 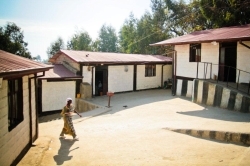 Within a year, the project had sourced a hub of buildings as a base for the rehabilitative shelter 5 kilometers from the holy water site and was accommodating a steady influx of HIV patients. HIV testing, counseling, ART treatment, and care had been made available to the holy well community. The shelter community is widely recognized for having succeeded in empowering a large HIV community to overcome fear and stigma and reach out for ART. With the support of I-TECH management and training, the shelter has been one of the few places in Ethiopia to offer rehabilitation and care to those who have been excluded from their family and community because of their HIV status, says Misti McDowell, Country Director for I-TECH Ethiopia. 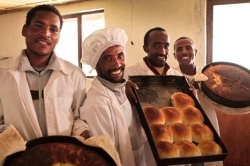 The bakery at Tsadkane supplies both nutritious food and income for patients. To help patients rehabilitate, I-TECH funded the installation of a bakery, a dairy, a restaurant, and a seed-oil extraction mill to offer income-generating activities. The aim of these activities was to provide economic empowerment and livelihood training for patients so that they could have an active role in their home community. The Tsadkane shelter also prioritizes the security and welfare of children born to HIV-infected mothers by providing a dormitory, a playground, schooling, and immediate HIV testing of all children entering the shelter. To help the shelter improve its service delivery, I-TECH conducted an organizational capacity assessment in 2012. In early 2014, Tsige Birhanu, 38, arrived at the shelter center on a stretcher. She was weak and emaciated; many feared she would not survive another week. She had been sleeping on a plastic sheet by the well for nine months. Like many pilgrims, she had been subsisting on a diet of holy water and small amounts of barleycorn flour. After suffering frequent bouts of vomiting and diarrhea,she was carried to a nearby hospital where she was diagnosed with TB and HIV.